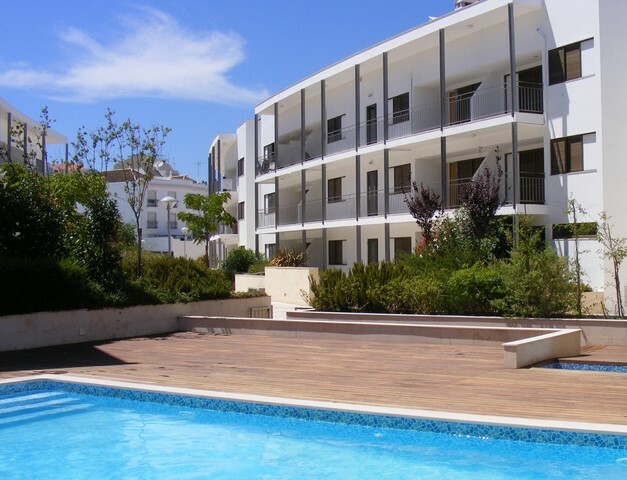 Beautiful apartment with communal swimming pool in the center of Tavira with garage. Location: Tavira, Horta Poço do Bispo. Construction: approx 90 m2. Built in 2008. This very nice luxury apartment is situated in the center of Tavira in a tranquil location and has a stylish decoration and is very well equipped. Ideal for families or couples. Due to the location a car is not needed, however, there is off street parking available. The apartment consists of a spacious living room with comfortable sofas and chairs, a dining area, a fully equipped kitchen with integrated dishwasher, washing machine and fridge/freezer and storage room. Two good size bedrooms (one with double bed, one with two single beds) with built-in wardrobes sharing a spacious family bathroom with bath and shower. Access from the living room onto a terrace with outdoor sofa, chairs and table. The complex is fully fenced and features a communal swimming pool with sun terrace. Within minutes from the apartment you find all amenities such as restaurants, supermarkets, cafes, and the old historical center of Tavira. Throughout summer there is a ferry going to the beach on Tavira Island. The boat stop in front of our office along the riverside, a short walk (350m) from the apartment. During the summer months, parking can be an issue in Tavira. This apartment has off street parking in the garage. All rooms have air conditioning. Satellite TV (flat panel) and audio system. Faro: 30 km; Spain: 28 km; nearest golf course (Benamor): 3 km; Ferry to Beach: 300 mtr; nearest restaurant: 200 mtr; Supermarket: 200 mtr; Tavira town center: 0 km; Train station: 1 km; Bus station: 850 mtr. Prices are per week. Final cleaning included. Minimum stay one week. Surcharge applicable for shorter stays. No smoking in the apartment!